Today's Nice Price or Crack Pipe contender will require some fancy footwork owing to its six-speed stick. You'll have to decide if that rare option, and its relatively low miles, ensures its price isn't the same old Saab and dance. Our fun and games were rudely interrupted yesterday when the object of our attention - the 1965 Sunbeam Tiger described as running like new - was unceremoniously sold before most of us could weigh in on whether its price was a deal or not. That didn't stop the pluckiest of you from doing so anyway, because that's just how you roll. Hopefully the new owner was able to drive away for less than the asking, seeing as that Tiger was striped with a 76% Crack Pipe loss. Hey, remember Saab? You know, funny cars designed by airplane engineers and featuring spunky two-stroke triples and a penchant for rally wins and inspiring the phrase Carlsson på taket? No? Well, how about eclectic cars with wrap-around windscreens, backward engines originally sourced from Triumph, and their ignition switch between the seats? Still not ringing a bell? Okay, how about the Saabs that were little more than thinly veiled Opels with GM Ecotec engines? Ah, there we go. The Saab 9-3 of the past decade eschewed much of the uniqueness that made its pre-GM ancestors so damn quirky and endearing. That's not to say these weren't good cars, in fact they're probably some of the best that GM's stable had to offer during the Aughts. This 2003 Saab 9-3 is an upper-level Arc model, which means it should rock the 207-bhp B207R. That's a 2-litre DOHC all-aluminum four, fitted with a Mitsubishi turbo. Backing that up is the car's starring player, a 6-speed F40 manual. 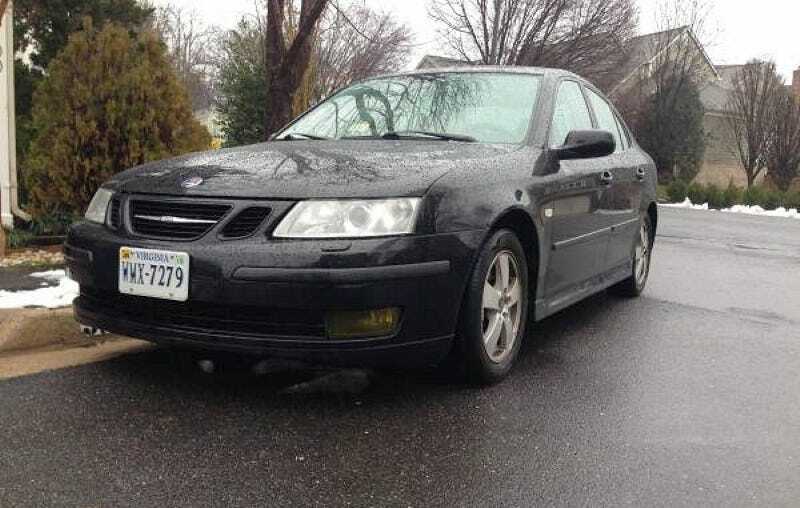 That option was removed the following year so its presence here, along with the upscale trim level, makes this an interesting, and relatively unique Swede. Overall it's pretty stock too, the ad noting a cold air intake as the sole mechanical mod having been made to the car. That's a bit of kit that perhaps could be reversed if you don't go in for intake noise. Visually the car looks to be in pretty good shape both inside and out, with the ad claiming but a few scratches in the paint here are there - but nothing major. There is also a Euro front end according to the ad, which eliminates the front side marker lights. I don't know if that's a mod that's impressive enough to get you laid by a Saab groupie however, but there it is. The seller says everything works, and that the Cooper tires still rock sufficient tread. The car has done 96,000 miles, or about 8K a year, which isn't bad. Also there an add-on roof rack available if you happen to know the secret handshake - hint, it's the one that include money. The 9-3 has always been a little bit more Opel than Saab, but there is still the key between the seats and the fact that it was built in Sweden to give you the sense of tradition. This one, with its energetic engine and buffet of gears transmission looks to be a pretty good - and is pretty unique - but is it worth $4,800? What's your take on this 9-3 for four-eight? Is that a price that should have a new owner dancing with joy? Or, does that price seem shifty? H/T to Charles Van Someren for the hookup!